Oak Solids with Walnut veneer. Bullnose edge. Lower shelf with curvilinear front. Excellent refinished condition. 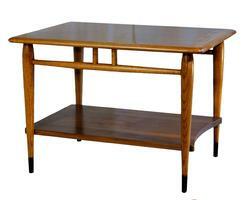 Table is solid and sturdy, has been fully restored. Attractively figured walnut veneers. The Acclaim design was patented in 1959; this example was produced on October 29, 1964.